Are you a shortbread fan? It is the quintessential Christmas treat and one that I love love love. It’s hard to believe that such a simple cookie can be so delicious but that’s butter for you! Just a few everyday ingredients make one of the sweetest cookies going around. 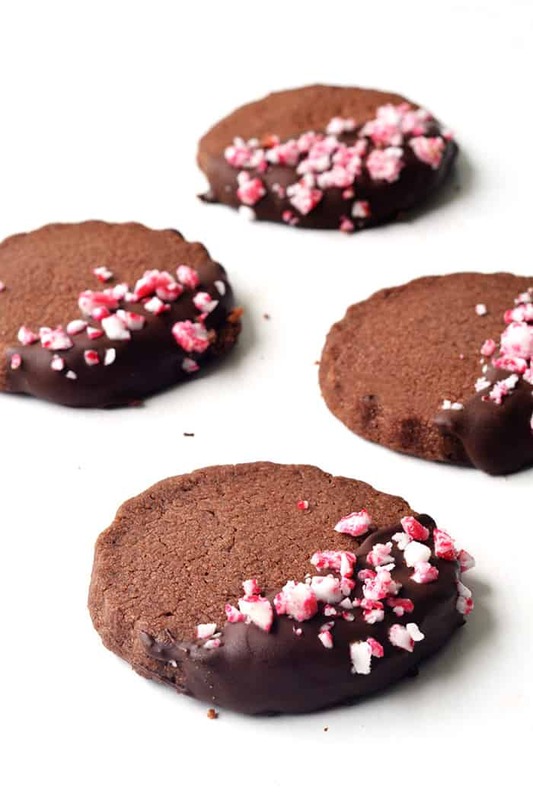 This buttery chocolate shortbread is baked to perfection, then dipped in melted chocolate and covered in candy cane crumbs. 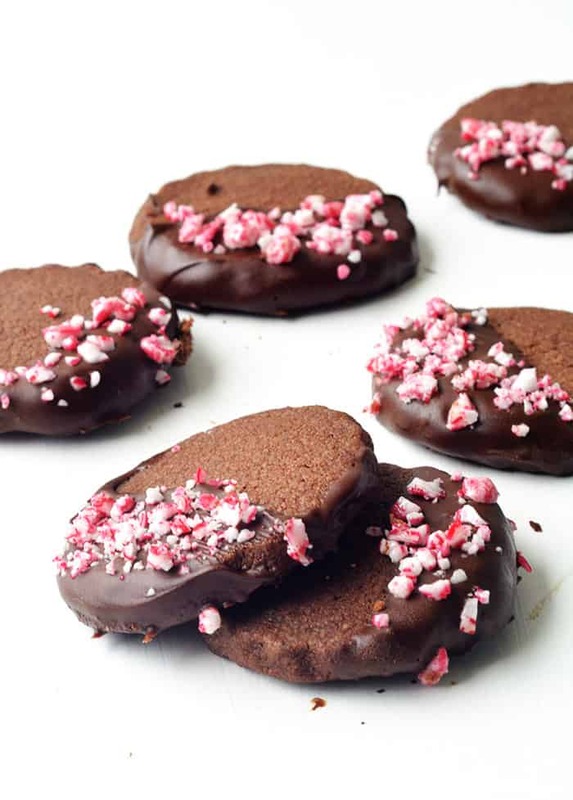 Crumbly and sweet with a hint of peppermint – it is the ultimate holiday cookie! The best part about this cookie is you can either roll the dough and cut into shapes like I did. OR you can freeze the dough and just slice and bake the cookies when you need to. How easy is that? You can even get the kids involved in cutting out the dough or dipping the cookies in chocolate (my favourite part). It’s also up to you how thick or thin you cut your dough. I like a chunky cookie but feel free to roll it out thinner if you prefer a more crispy cookie. The same goes with the baking time. A few minutes longer will give you a crisper, crunchier cookie and a few minutes less, a softer, buttery cookie. Each to their own am I right? Both are equally delicious. 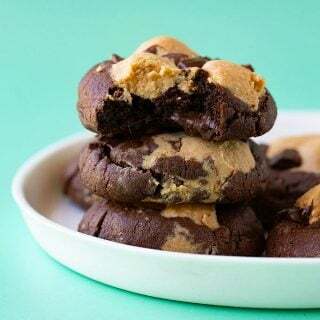 To squeeze in just a little more minty goodness, you can also add peppermint extract to the cookie dough for that choc mint hit. But the crushed candy canes add plenty of minty goodness so it’s really up to you. I cannot believe its the first of December today. I mean where has this year gone? I feel like the more I say that the faster time flies. We’ve already been living in Sydney for three months. In some ways it’s gone so fast, in others it feels like we’ve been here forever. We’ve already made some new friendships and I feel like I’ve known these people forever! What a gift. Have you started your Christmas shopping? I’m a bit tight on time this year so I’m going to try and do mine in 2 big hits. Usually I’m a piece by piece person. But tonight. I’m going late night shopping with my list in hand and my credit card on tap. Happy baking! 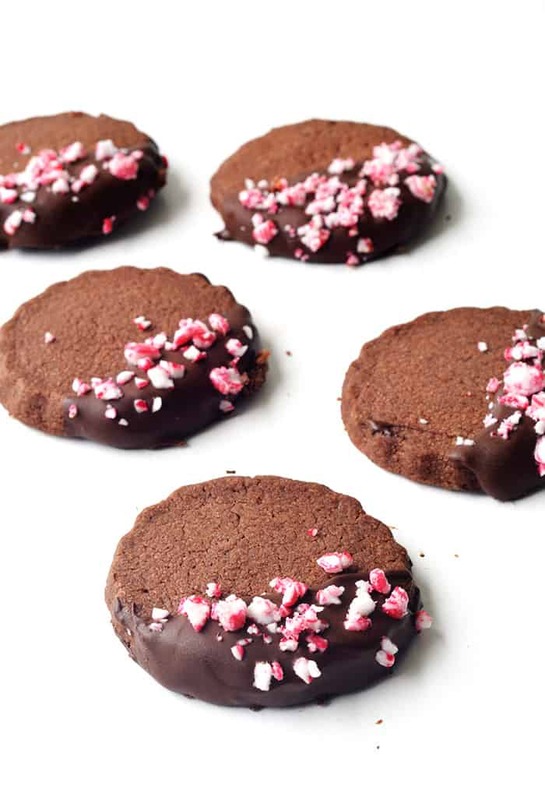 Peppermint Chocolate Shortbread Cookies, buttery cookies baked to perfection, then dipped in melted chocolate and covered in candy cane crumbs. In a large mixing bowl, beat the butter for approximately 2 minutes or until pale and creamy. 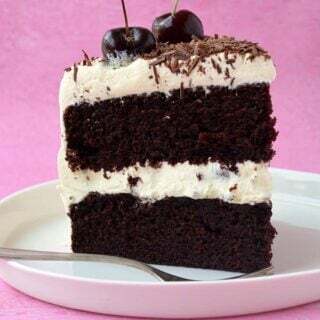 Sift in the powdered or icing sugar and the vanilla extract or peppermint extract and beat again. Sift in the flour and cocoa powder and stir until combined and a soft dough forms. Shape the dough into a ball, wrap in plastic and refrigerate for at least 30 minutes. Preheat the oven to 160 C (320 F). 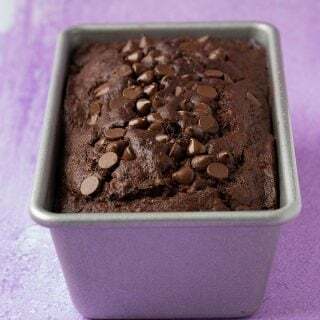 Line a baking tray with baking or parchment paper. Lightly flour your bench and roll out your dough to your preferred thickness. Cut out shapes with cookie cutters and place on your prepared tray. Bake in the oven for approximately 10-15 minutes before transferring to a wire rack to cool completely. Melt your chocolate in the microwave, stirring in between 15 second bursts. Dip your cookies, one at a time, into the chocolate and then place on your wire rack. 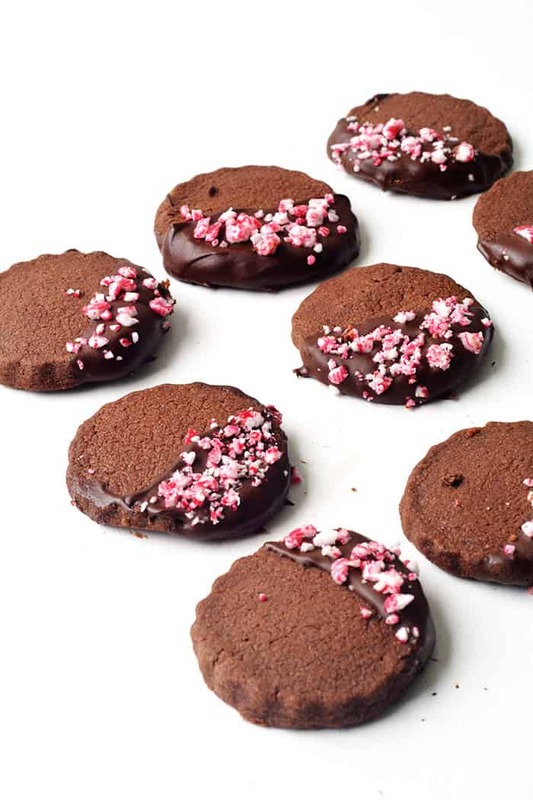 Sprinkle over candy cane crumbs before the chocolate sets. Repeat. Place the dough onto a piece of baking or wax paper and spread out into a long circular roll. Cover with cling wrap and place in the freezer until you are ready to bake. To cook the cookies, thaw for 10-15 minutes before cutting into 1/2 inch slices and placing on a baking tray lined with baking paper. Bake at 160 C (320 F) for approximately 15 -17 minutes. Just curious as to how long they will keep for? I’m itching to do some baking (it’s been a LONG time) and we’re a few weeks out from Christmas, but I want to use these as gifts. I’ve made my “to buy” list and am about to go and get everything I’ll need. Problem is because it’s Summer, there are a few cool enough days to get the oven going! Hi Stephanie! Great question! 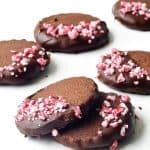 These are quite hardy cookies and they keep well for up to 5 days. You can also make the dough and chill it in the freezer if you’d like to make it ahead of time. Just bring it to room temperature (it’s ok if it’s fridge cold) before continuing with Step 2. I hope that helps! 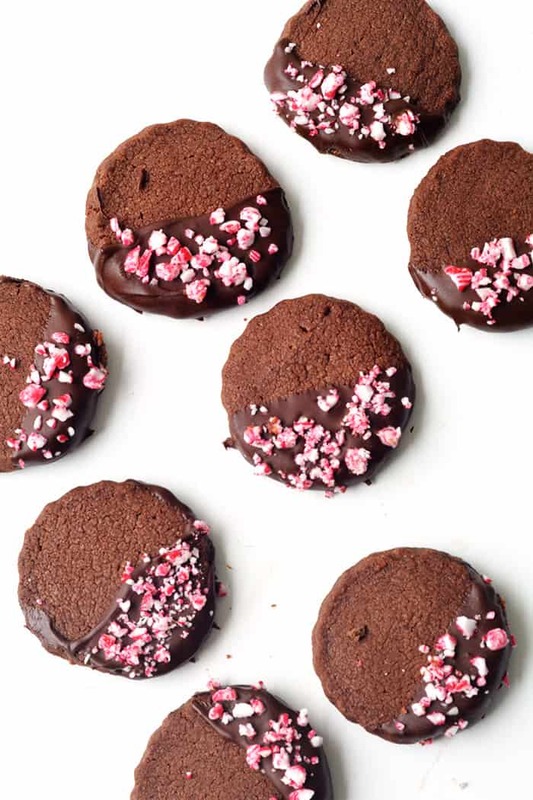 This looks like the perfect Christmas cookie, yum! I am a huge shortbread fan! It’s a must for me at Christmas! LOVE this chocolate version! !